I’m back now from Halifax, and let me tell you there is nothing like a bit of travel to remind yourself about the big-ness of Canada. I left Halifax yesterday when it was gloomy and grey and rainy, and stepped off the plane in Hamilton into a sunny, cloudless, blazing hot summer. It seems June has finally arrived, despite my fervent hope that we were going to just stay at about 23 C forever and skip the hot humidity…this just means my knitting plans are going to have to drift a little more intensely towards the ‘small’, and dang that Autumn Rose pullover is going to need to get finished in a hurry before I start to dread the sensation of a heap of wool in my hands. But I digress. I can report once again, that Halifax is a lovely spot for a knitter to spend time in. I found yarn shops, naturally – I believe LK Yarns remains my favourite, and I enjoyed going back there. They had some sport-weight wool that I needed for some Sock Summit homework, and I had a very nice chat with the owner. Another nice find across the river was Tangled Skeins (picture above), in Dartmouth (have been unable to locate a website for them but someone please feel free to correct me), which my hosts obligingly drove me to. It really is a good little shop. They’ve got a fantastic variety for such a small space, and a skein of Malabrigo silky wool came home with me from amidst some very tempting wares. You’ll find Cascade, Mountain Colors, Noro, lots of different things there. And then when you get tired of eating things (perish the thought), you can check out some of the awesome used bookstores. 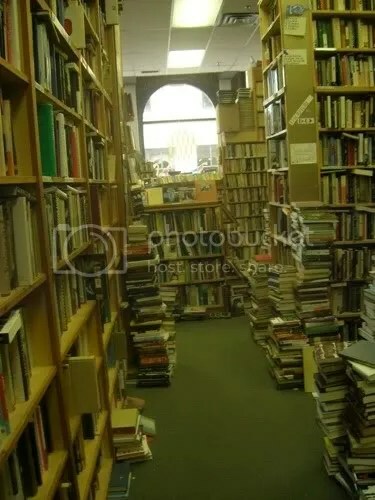 I carted home quite a few from Doull’s, where you could easily lose an hour or more of your life just browsing through the shelves and stacks. And more than that, I finished a pair of socks and started a shawl, which is so far going swimmingly. More on that next time! I hope your week is starting off well. What’s the newest project on your needles? sounds like a lovely trip — i haven’t made it up to halifax yet, but this past winter i visited montreal, trois rivieres (and a national park north of there for some snowshoeing), and quebec. more of the northeastern chunk of canada is on my list! in the realm of projects, i joined the socks from the toe up KAL on ravelry and am working on the june socks from the book — the lacy ribs socks. almost ready to turn the heel! So jealous about the bookstore! I am struggling to finish a scarf that seems to get shorter the more I knit, as if it’s breaching the space time continuum. Next up: baby sweater, it will be my first. Well, that looks like an utterly charming time…. I’m jealous! I spent a week in Halifax at the beginning of the month and hit many of the same spots as you! 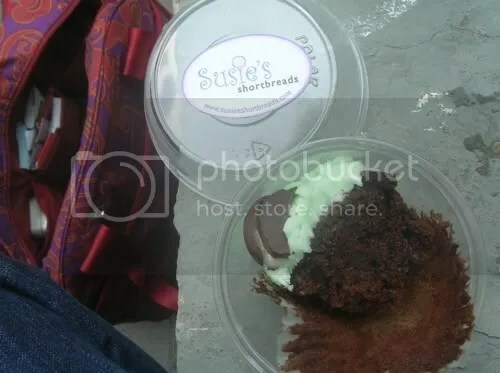 Suzie’s cupcakes are amazing aren’t they? Montreal finally got a heat wave too, it’s currently 30C, not ideal weather for finishing up my Girasole! Looks like a wonderful trip! I need to make it to Halifax sometime soon (all those Anne of Green Gables books really did a number on me as a kid). Mmm… cupcakes, books, and yarn. What could be better? I also just flew back from the rainy, gray East Coast — Maine, in my case. If I go back to Maine (which I’d like to do) I can see that I need to bring my passport and go yarn shopping in Halifax. Looks like a wonderful trip! That bookstore looks like an amazing place to get lost in! I’m crocheting squares for the Babette blanket. I’m having flashbacks to when I was a new knitter, except now I’m a new crocheter. I’ve been itching to start some lace, so I think I’ll cast something on today. Died and gone to heaven!! What a fantastic way to spend a few days. the bookstore looks like it smelled so yummy! See you at the Summit! I can’t believe you went to Doull’s and didn’t take a picture of the staircase! It’s my favourite part! Sadly, by the time I got around to visiting Barrington St, it was Sunday and my last day there, and they were closed. So upsetting.